FREE shipping on online orders over R2000! You can collect up to 64 loyalty points. Total 64 points that can be converted into a voucher of R 6. The sleek polymer tip increases the ballistic coefficient, making it more efficient. Upon impact, the tip also initiates controlled expansion. It’s a fact: bullets that travel faster hit harder. 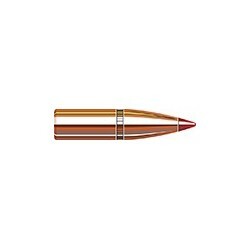 The Hornady® secant ogive gives hunters the speed, ballistic efficiency and downrange energy they’re looking for. Provides accurate and consistent crimping, and also works with the InterLock® ring to control expansion. Ensures the core and jacket remain locked solid during expansion, so the SST® retains the mass and energy needed for dramatic wound channels.